Los Angeles-based artist Manny Prieres drops by the House for a discussion on appropriation and the art of transferring a preprinted image from one surface to another, plus cocktails and a lesson in transfer printmaking. 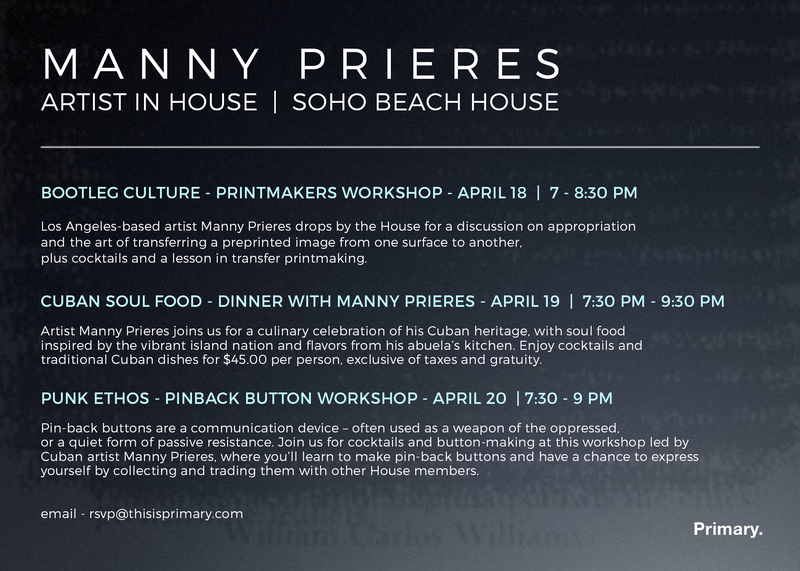 Artist Manny Prieres joins us for a culinary celebration of his Cuban heritage, with soul food inspired by the vibrant island nation and flavors from his abuela’s kitchen. Enjoy cocktails and traditional Cuban dishes for $45.00 per person, exclusive of taxes and gratuity. Manny Prieres (b. 1972, Madrid) addresses the influence of mass communication mostly in the print and digital medium. The work is informed by graphic language and how different social groups have used it to convey or contain ideas. He is interested in how graphic design and the written word are used in art, and ideas that were at one time taboo, fringe or targeted for elimination become cultural sublimation. Another aspect of his work is dealing with the “death of print”. Print being rapidly replaced with digital media in all aspects of culture. The artist is interested in this disruption. 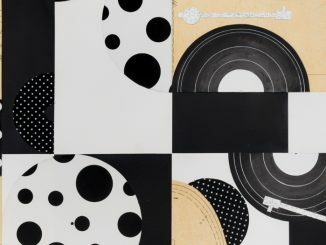 He intentionally explores this topic through traditional forms of making such as drawing, painting and digital printing. The method is itself a form of serial production. 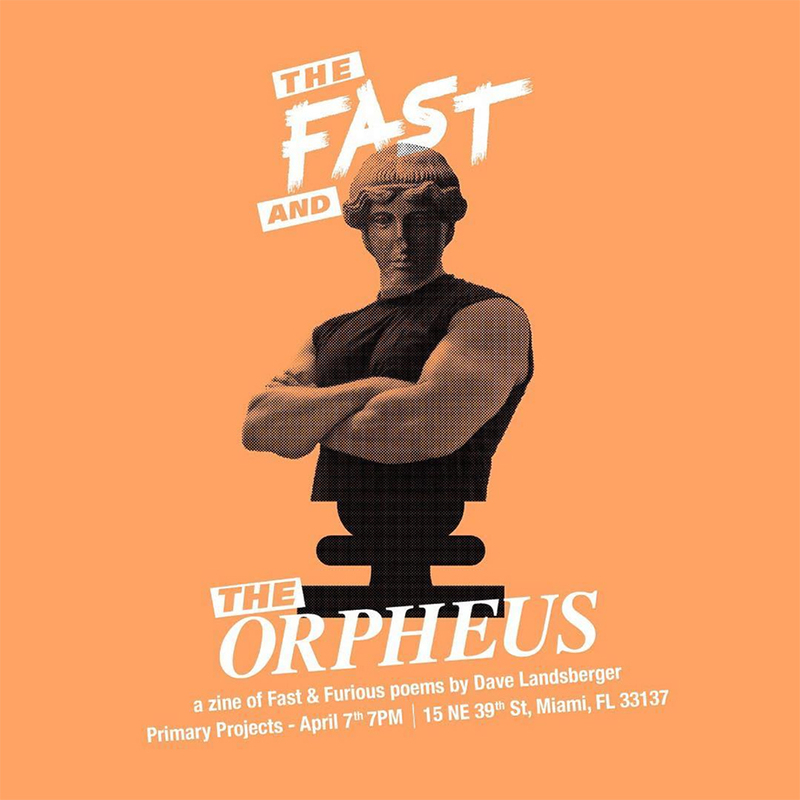 Replacing the printing press with the hand and by different means repeating the process of creating editions where the outcome is never a perfect facsimile of the original. The final outcome is a nonsensical remnant of the source material, with mathematical precision. Prieres has shown work at venues in Auckland, Mexico City, New York, Istanbul, Baltimore, Los Angeles and Miami. He was an artist-in-residence at Cannonball (formerly LegalArt) Miami. Prieres was featured prominently in the New Works group exhibition at the Miami Art Museum in 2010. 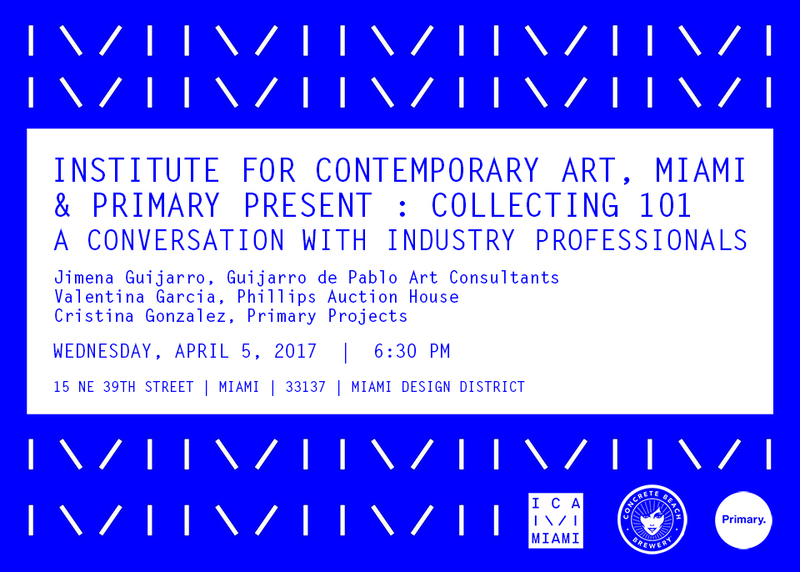 He has been featured in publications including Art Papers, Art Nexus, El Nuevo Herald, Installation Magazine and Whitehot Magazine. In 2013, Prieres’ had his first museum solo exhibition, It Was A Pleasure to Burn, was staged at The Bass Museum of Art, Miami. After the exhibition the museum acquired work for their permanent collection. Though raised in Miami, Prieres now lives and works in Los Angeles. Looking forward to a great week of projects at the house. Availability is filling up, if you would like to attend an event, please email us at rsvp@thisisprimary.com.